Was Hottaman no Chitei Tanken ever ripped? I have added the missing battle music to kingshriek's original NSF of Ganbare Goemon Gaiden 2, reordered the songs according to the OST, and made an NSFe with track titles. I have not added length tags to the NSFe. The NSF also contains all sound effects, the NSFe does not (except for one used on the OST). MrNorbert1994's rerip of this game did include the sound effects but not the battle music. Thanks to Gnome for raising awareness of this issue, and pointing me to the original OST. With a SFX rip for Exciting Rally: World Rally Championship / Championship Rally. I'm interested. What makes this driver so bad? From what I remember, this driver makes every subtune only one channel. To play multiple channels, you have to call the init routine multiple times. Seems pretty nonsensical to me, but I wouldn't really say "bad", just "a pain to deal with." Is the Championship Rally the same one used in Kabuki: Quantum Fighter? - Donkey Kong, Donkey Kong Jr., Donkey Kong 3, Donkey Kong Classics, Donkey Kong Jr. Math, Mario Bros., and Pinball - Re-ripped to include all versions of each game with sound effects. - Double Dribble (PAL) - PAL version exists. - Mario Bros. Classic - A 1993 PAL-exclusive version of Mario Bros. that has been changed, including in sound data, compared to the original one. - Micro Machines - Re-ripped to include all versions (regular US cart, Aladdin cart, and European version). Sound effects don't matter for now, but are preferred. - Rush'n Attack - Re-ripped to include all versions with sound effects (NTSC, PAL, FDS). - Rollerball (PAL) - PAL version of Rollerball does exist, but was supposedly only released in Australia. Only US and Japanese versions are ripped. - The Simpsons: Bartman Meets Radioactive Man - Re-ripped to include all versions (US and EU) with sound effects. Might have already been re-ripped. - Star Trek: 25th Anniversary (PAL) - PAL version exists, but supposedly only in German? That's all I have for now. I hope Mr. Norbert or someone else will eventually get around to ripping as many of these as you can soon. This is how I ripped Kabuki Quantum Fighter. The first image is building up custom init routines for the channels to be merged with. 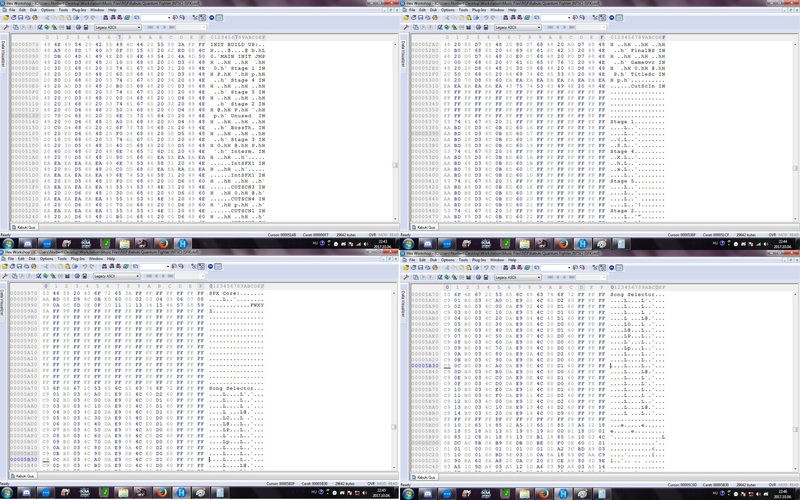 The second image is just calling the channel numbers line by line (Notice it uses $ED0B) all the time). Calling every single song as in the OST was inteneded for. So yeah, it is tedious as all hell. Here is Mario Bros Classic. The few NSF rips that was avaliable for this set up the bankswitch bytes as 05 05 05 05 05 05 05 05 which is not allowed. Also, I made a sub-lookuptable at $E300 for proper song ordering. Disregard my previous rip, since it had a lot of unused code. I hope every single SFX is here, since Nintendo liked to place its SFXs to separate init routes. I reripped Gil Galad's original Rampart rip (Jaleco version). Last edited by MrNorbert1994 on Sun Oct 22, 2017 12:18 pm, edited 1 time in total.